It is really frustrating living in a rental sometimes! There are SO many changes I want to make, but I have to keep telling myself over and over not to spend too much money on a place that I don't own. How gross, they are rusted and have nasty dried paint everywhere. At first I thought I would make a fabric skirt-thing and attach it with velcro to cover them up. But on second thought I knew there was something easier I could to to make them look 100% better. A trip to Home Depot later and I have my new best friend...ok I'm lying, it was really a trip to my Dad's shop and taking a piece of steel wool from him. So they are not brand-spankin new, but don't they look 100 times better?? I'm happy with the results for sure!! oh my gosh! what a difference! did you just use water and the steel wool or did you use some kind of super detergent? Kay- just the steel wool, no water or anything else. Amazing, right? Those look great...you are welcome to come do my sink legs ;) I am wondering how well the steel wool would work for the inside of the sink?? Mine has the legs that look like yours, but the sink has seen better days. I've even thought of using marine paint to cover it up. Wow! I can't believe you didn't use soap or anything! I am amazed and wish I had some rusty metal to try it on. Your funny. I wasn't sure what to expect when I read the post title. They look great! What an improvement and you've just given me an activity for the weekend. We have an older bathroom and it really wasn't in the budget to change the plumbing in the shower so I decided to embrace it, but it's not shiny. This should do the trick! Camila- def post before and after pics too! I'd love to see how they turn out. 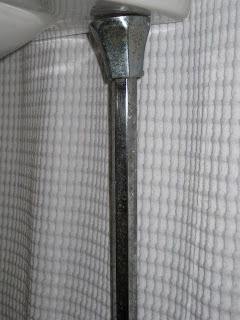 One thing to be careful with the steel wool in wet environments is that the inevitable little pieces will rust. The sailor's trick is to use bronze or stainless steel wool. Look for it at marine supply stores! Steel wool is also useful for plugging holes in your floor to keep the rats out. Thanks Anon 3:33 & Anon 3:40- I will keep both those thigns in mind. Actually I need to get a clear spray to coat the legs with to keep the rust from coming back quickly. 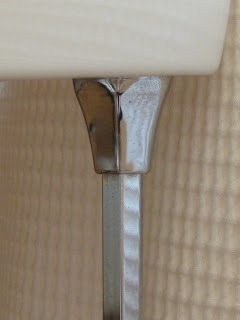 I know the rust is sure to come back again since they are in a bathroom that gets humid alot. Anon 3:33 here! Good idea on the clear spray, but the rust I was talking about is the tiny pieces of steel wool that come off the pads as you're cleaning. These little splinters then get EVERYWHERE and rust, leaving red-orange spots all over. OHH, I see what you are talking about now. I'll have to keep an eye out for those little spots to start showing up. 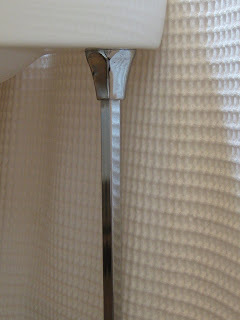 I was pretty nutty about cleaning up before and after because I didnt want to be stepping on those little splinters after getting out of the shower. I'm keeping my fingers crossed I got them all. But, next time I do something like this I will def. check out a marine supply store- thanks for the tip! Lindsay!!! SO glad you just posted on this!! 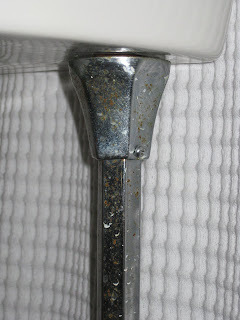 I just picked up a little chrome stool at a flea market & didn't know how to clean it up!! !